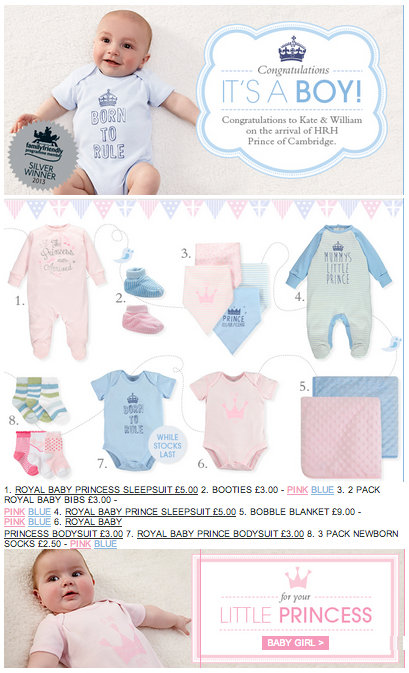 This entry was posted in Clothes, Pink and blue and tagged baby clothes, prince, princess, royal baby by janetmck. Bookmark the permalink. You have probably already seen my retweet of Ben Goldacre saying ‘hoping to see a lot of little boy babies wearing these this season’ – of a hideous pink babygro saying ‘One day I’m going to marry Prince George’. Would be a lovely way to subvert it – if anyone looking actually could tell that it was a little boy baby wearing it of course. Hmm. A flaw in the plan there!